Major Michael D. Sward is a Joint Integrated Air and Missile Defense Staff Officer, Space and IAMD Division, Operations Directorate, U.S. Pacific Command, Camp H.M. Smith, Hawaii. He is responsible for providing strategic advice and support to the Commander, U.S. Pacific Command, and synchronizing the employment of joint, Pacific IAMD capabilities for regional and homeland defense. Major Sward entered the Air Force in 2001 through the Reserve Officer Training Corps program at Indiana University. 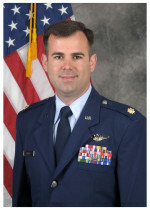 During his career he has served in a variety of positions, including instructor and evaluator air battle manager, E-3 AWACS and CRC Weapons Officer, Flight Commander, Executive Officer, Chief of Group Weapons and Tactics, Assistant Director of Operations, and Chief of Group Standardization and Evaluation. Major Sward has deployed four times in support of the War on Terrorism, and served as a Detachment Commander in Afghanistan, leading 10 Airmen responsible for transitioning tactical command and control from the Royal Australian Air Force to the United States Air Force. He also served as a Detachment Commander in Iceland where he led 25 coalition personnel policing NATO’s northern most sovereign borders, and led planning efforts in South America while supporting counter drug operations. Prior to his current assignment, Major Sward was the Executive Officer to the Deputy Commander, U.S. Air Forces Central Command, and Deputy Combined Forces Air Component Commander, U.S. Central Command, Al Udeid Air Base, Qatar. Major Sward is a senior air battle manager with more than 900 hours in the E-3 AWACS and more than 1,000 hours, to include 343 combat hours, in the CRC.